If you’ve read my book you know that I once waited tables. While free food and employee camaraderie was the only thing I enjoyed about it, being stiffed by poor tippers far too often was a reason I loathe to return to such an occupation, even now as I grovel for another cubicle stance. The average tip/gratuity now is a standard 15% of the total amount of food one is served with waiters earning around $2.15 per hour sans tips. Since tipping is primarily suggested, of course there are huge swings in the amount that is often given. 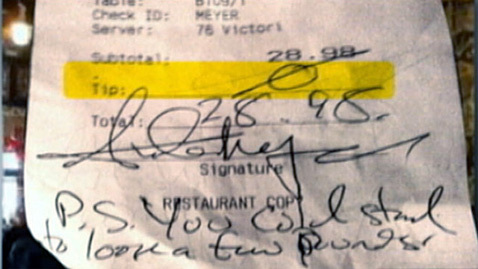 Online one can find horror stories of poor tippers, rude customers, etc. Sure, there have been the unlikely fairytale stories of huge tips (even waiters being left in longtime customers’ Last Will & Testaments) that pop up out of the rubbage but most of the wowza tipping stories that make headlines are just plain dogged. 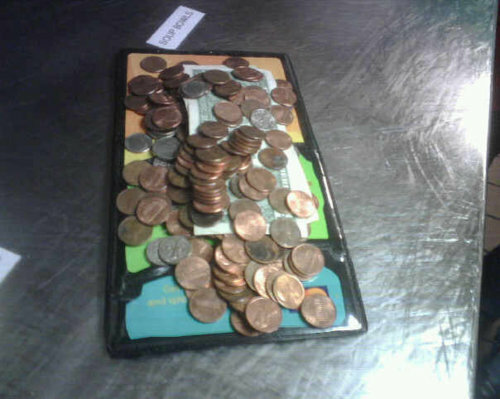 Mostly pennies left by a patron. This kind of stuff happened to me all the time while in Baltimore waiting tables. You should’ve seen how wide my nostrils could flare. Looks like a $10 tip, eh? Also looks as if they thoroughly enjoyed their meal. 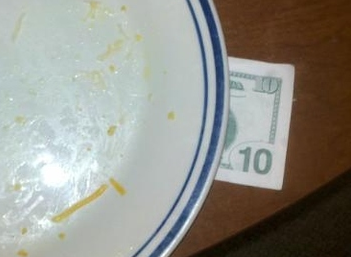 Is that a mere trace of pasta I see left on the plate? 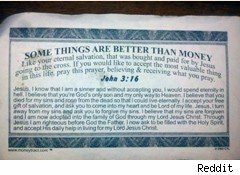 It’s what waiters/waitresses call “Fake Jesus Money” or “religious tips.” These are typically left on tables particularly on Sundays across America. I mean, technically it’s a tip, sure, but who in the dickens goes to work to receive written tips?! Oy. Customers can be quite testy. It’s why I tend to avoid retail/restaurant work altogether. Results of a poll shows it pays to be blonde if you’re a waitress in France. According to the findings, tips are 25% bigger for blondes, compared to those left for brunettes. The finding comes from The University of Southern Brittany. But that only holds true for men who tip – women diners showed no preference for blonde waitresses. Now don’t get me wrong, I truly realize the table waiting profession can be and is quite lucrative and satisfying and all that. I get it. Oh, I get it. But it’s the uncertainty of each day or night’s tally, particularly in an average restaurant, that makes me return to CubicleVille instead. Customers can be the worst. At least in CubicleVille I only have the usual suspects to deal with; once I master them and their idiosyncrasies I’m coasting. Sort of. With public service jobs any ole random goofball can enter your job stance and wreak havoc on not only your head but your fluctuating finances. For surely the customer ain’t always right…in the head. I need to rant and you’re here so I’ll rant to you. I’m in the job hunt of my life. I mean, gosh, when I was 12 I think I could get a job easier than today. NOW I’m equipped with a much hooted about college degree (I’ve had it probably 6.8 million years already), years and years of “experience” and even a two-page resume. But still, no takers. I’m starting to think my resume has halitosis. Whenever I interview I go in all gussied up (read: hair is tamed, nylons with zero runs, Cheshire the Cat smile even to the point of cheek muscle cramping, firm handshake, blazing eye contact that makes my eyes water…Yeah, yeah, all that). I always think when the interview went well that I’ve just landed the job, that it’s a matter of hours or mere days when I’ll receive the wondrous call that I can now pay my bills on time and fix my car and eat something other than bread with cheese and the occasional kidney bean. But the call never comes. Days pass. Weeks. I check my phone to make sure the battery is charged. Silence from the powers that be. Then I start taking it personally. I mean, is my forehead too large? I was teased relentlessly about it throughout high school and even college. Are my teeth not white enough? Dang those stupid Dr. Peppers. What gives? The WORLD told me to go to college. I did. They told me to wear these clothes to interviews. I did. They told me to present myself well. I did. Recession? Whatchoo talkin’ ’bout Willis? I know there’s a recession but even during a recession at some point I should land a job–I mean, they called me in in the first place, right? Then I start imagining who actually landed the gig and why they landed it over me. I mean, were her clothes sharper than mine? Did she type six more words per minute than I do? Was he charming in the interview–I need to learn charm stuff. I’m so not charming. Was it the new mountain of a zit that decided to rise up on my cheek the very day before the interview? If I had popped it it would’ve been uglier so I decided to just leave it as is. Is it karma? I mean, my book and this blog mocks The Establishment to the hills (and will continue to do so) so could it be some sort of universe-is-mocking me vortex thing? I’m considering just taking a waitress gig. But they want “experience.” Please tell me, what is “experience” when it comes to approaching a table of people, asking them what they would like to order from a menu they’ve already eyeballed and then taking their order and bringing their order to their table with a smile? Really, do I need experience to do that? I’ve carried food to many tables before. I’ve talked to strangers before. Must have strong customer service skills! What determines “strong”? This very line bothers me to my innermost fibrous innards. As long as I’m performing the job at hand–ahem–isn’t that strong enough? The Server ensures all guests are provided with prompt and friendly service according to [the restaurant’s] standards. The Server describes menu items, assists guests in making food and beverage selections, takes and rings in orders, delivers food and beverages, processes payments, and assists fellow team members to ensure overall guest satisfaction. Sure, I can do all of this. No problem. So why do I need on-paper “experience”? I’m so annoyed I think I may go eat a box of cookies. But I can’t afford it. In fact, I can’t even talk/type about this any more. It’s become a full-time job groveling for a real job.